If you're looking for a laptop with gaming power, but don't relish the thought of lugging around a 17-inch beast, the AVADirect Clevo W110ER could be for you. It has a much smaller footprint and an 11.6-inch display, but many of the same internal components that you'll find in a basic gaming laptop of significantly larger dimensions: a Core i7-3610QM CPU, 16GB of system memory, a GeForce GT 650M GPU, and a 7200-rpm, 750GB hard drive in the configuration we tested (which costs approximately $1350, as of June 19, 2012). While the Clevo W110ER is smaller than most gaming laptops, it's hardly a thin-and-light model. It measures only 11.2 inches wide and a mere 8.25 inches from front edge to back, but it's also 1.4 inches thick and weighs a hefty 3.8 pounds. Throw in a massive 2-pound, 6.3-amp power brick, and it travels heavier than some mainstream laptops, though 5.8 pounds is feather-light compared with many of the gaming notebooks we've tested. Despite its stocky profile, the Clevo W110ER is a better-than-average looking laptop. It has clean lines, and the way the keyboard is recessed into the deck adds a touch of class. Also, you can fully debadge it. That's hot-rodder talk for removing all traces of a car's origin by stripping it of logos. Pull the AVADirect peel-off label from the unit and you're in full stealth-branding mode. 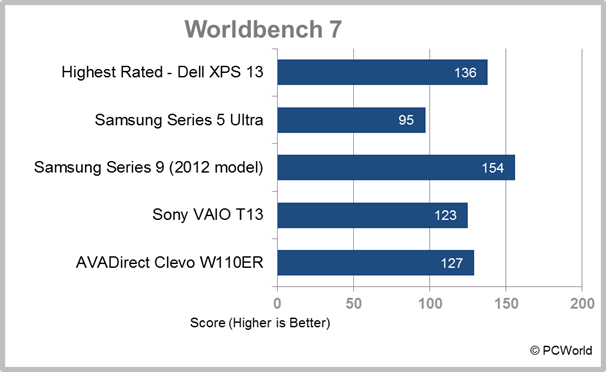 Using the aforementioned components, the W110ER turned in an impressive 127 score on WorldBench 7 and delivered playable gaming frame rates right on up to the 11.6-inch display's maximum 1366 by 768 resolution. In addition, 1080p video plays smooth as silk, and the 1.3-megapixel webcam renders a nice image. The W110ER also boots quickly in about 21 seconds. Beyond the benchmarks, Skyrim played very smoothly. The overall feel is, in word, snappy. Part of that crisp feel results from AVADirect not installing a ton of craplets on the machine. The only piece of software present that's not standard with the Windows 7 Professional operating system is the THX TruStudio Pro sound enhancement. It's there to add some depth, clarity, and oomph to audio for games and movies. The W110ER's tiny speakers won't do it justice, but it's useful through headphones. If you find the smallish display tolerable, the only real weakness of the Clevo W110ER is its Chiclet-style keyboard. It has a nice feel, but is simply too small for serious typing. With a frame of nearly three-quarters of an inch surrounding this keyboard in every direction, AVADirect had room to fit in a larger keyboard. The touchpad and buttons, on the other hand, are big enough. Ports should be more than adequate for the average user. The Clevo W110ER has both VGA and HDMI video output, two USB 3.0 ports, and a single USB 2.0 port. Also present are headphone and microphone jacks, an SD card slot, a Kensington lock port, and a gigabit ethernet jack. The rest of the connectivity comes courtesy of Intel's Centrino Advanced-N 6230 adapter, which provides 802.11a/g/n Wi-Fi as well as Bluetooth 3.0. It has no optical drive. 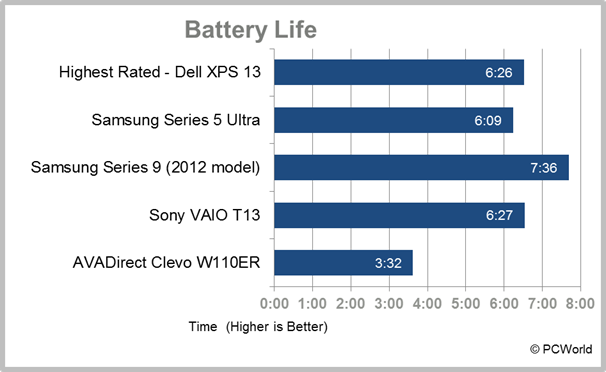 Your Clevo W110ER buying decision will hinge largely on whether you like its size. The smallish keyboard limits its usefulness as a business laptop, but the display's size didn't seem to be that much of an issue, at least when gaming. It's a bit pricey thanks to its cutting-edge components, but still a compact gamer's delight. Small, stocky but oddly handsome with great gaming—if you can handle the netbook-like ergonomics.